IFRS 17 is the new global standard replacing IFRS 4 for accounting periods beginning on or after 1 January 2021. The underlying objective of IFRS 17 is to provide greater transparency and enable more consistent reporting of profit across the industry. This is, in the view of the IAS, achieved through standard measurement models, increased granularity of reporting and the adoption of a new liability on the balance sheet called the “Contractual Service Margin”. Compliance is of the utmost importance, but if this leads to unnecessary complex processes with little business value, then this is not the right answer, neither is it the objective of IFRS 17. 4most has implemented IFRS changes for numerous clients in the banking sector and uses this invaluable experience to aid clients throughout financial services industries, including insurance. 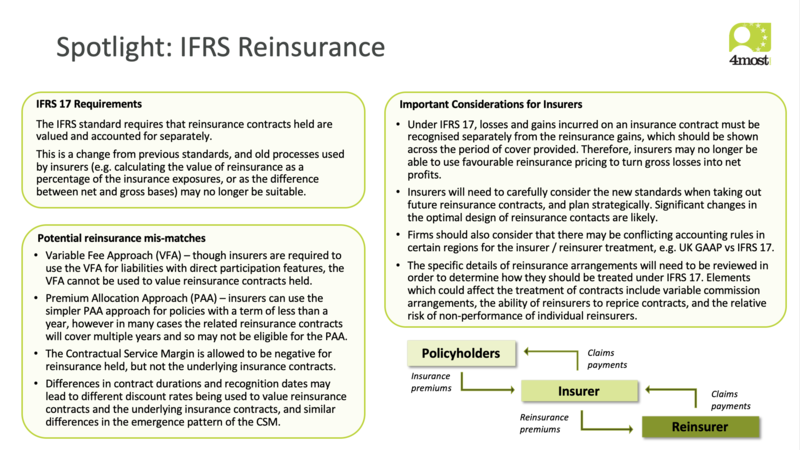 The insurance sector specifically is faced with several fundamental challenges from the implementation of IFRS 9 and IFRS 17 in 2021 (subject to further delays), replacing the interim standard of IFRS 4. Our view is that the objective of IFRS 17 is to aid profitability reporting and Management Information. As such, our approach, is to start from business needs and not necessarily a tick-box regulatory exercise. The new standard introduces a variety of changes across many different areas of the business, including data requirements, modelling and reporting of results. We are able to help insurers conduct a gap analysis to understand what work needs to be done to meet IFRS 17 requirements and identify areas of the business which will be most affected by the changes. IFRS 17 requires policies to be grouped at a much more granular level than previous standards, which will require expert judgement and may require changes to be made to systems. 4most can support firms in deciding how to group policies and in developing systems to automate the grouping process as much as possible. The new data, modelling, and reporting requirements of IFRS 17 may strain insurers existing valuation systems and put increased pressure on reporting teams’ timetables. We can help review firms' systems to identify areas where developments will be needed, support the design and implementation of any necessary changes, and review valuation processes to identify areas where work can be automated or leveraged between different reporting bases. IFRS 17 is similar in many aspects to SII and best estimate / embedded value calculations, however there are also some significant differences and areas where a variety of approaches could be taken. 4most are able to help insurers understand, answer and validate key business decisions on choices of actuarial methodology, including setting discount rates, determining contract boundaries, modelling and calibrating the risk adjustment, and the level of granularity to use in grouping policies. Insurers’ reporting teams are facing tightening deadlines under SII and significant upcoming changes to meet IFRS 17 requirements. We can help firms review reporting processes to identify the critical path, optimise workflows, and leverage work between SII, accounting, and internal management calculations. We would also aim to automate data collection and valuation processes as far as possible to reduce reporting times. The reporting of financial results will change significantly under IFRS 17, with particular impacts on how loss-making business and reinsurance contracts are reported. Insurers will also be required to disclose drivers of profit and report their analysis of changes in key elements of the balance sheet. 4most can help firms understand how their business will look under the new standards, explain changes in the results to internal and external stakeholders, and support reporting teams in carrying out IFRS 17 valuations. We can also help incorporate the new information produced as part of IFRS 17 into management information packs in order to aid risk management and profit reporting.